February 2016. An apparatus arrived at a logistic center in Saitama Prefecture. 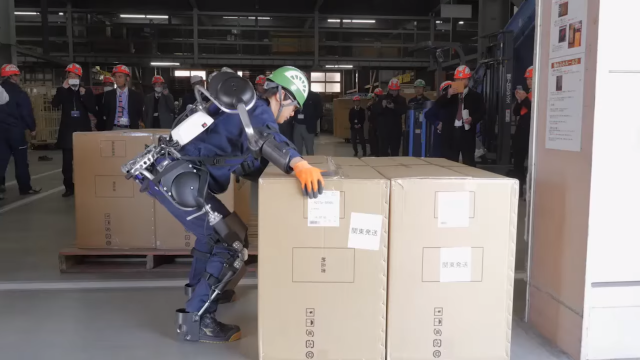 In Japan, an aging society that faces labor shortages, a demonstration experiment for the "Power Assist Suit" was about to begin. This Power Assist Suit was developed by Panasonic's venture arm, Activelink Co., Ltd., established in 2003. This video introduces Activelink's partnership with a furniture manufacturer as well as how closely Activelink works with its customers to reflect their needs, and its challenge to create new value. For 13 years since its foundation, Activelink has developed numerous Power Assist Robots to help lighten the load for people working in the field. President Hiromichi Fujimoto describes the company's unwavering vision as follows: "We believe that removing barriers by supplementing power will definitely help society. We named this belief 'Power Barrier-less.'" The newest prototype, the "Ninja" is a full body Power Assist Suit that has been designed to help lift and carry heavy objects. The lower half helps you stand up and assists lower body movement when carrying heavy objects. And the upper half helps arms lift objects. The development of this suit began in 2013. Since then for 3 years, Activelink has worked very hard to lighten its weight. In 2015, a refueling demonstration using the "Ninja" was organized at the Suzuka 8 Hours Endurance Race, but now an experimental demonstration was about to begin at a logistic center, a place where these suit would really come in handy. The company's efforts to date would be put to the test. President Fujimoto believes that it is important to introduce its prototype at an early stage of development to hear suggestions from people about how else it may be used. This kind of feedback serves as the first step in developing applications. The demonstration began as Makoto Konishi, the Group Manager of the Product Development Division and Shohei Habasaki an engineer from Activelink watched with bated breath. This experiment was held at the logistic center of a furniture manufacturer, Nitori. Inside workers were carrying packages of all different sizes. People working on the ground say, "It's not an easy job, so it has become increasingly difficult to secure staff. Having said that, in warehouses, it would be impossible to rely 100% on machines." So there is great hope that the Power Assist Suit would be implemented at the logistic center as soon as possible. Many interested persons had gathered to get a first glimpse of the Power Assist Suit. The staff, who first tried lifting a 26kg sofa, said "It was really easy. I didn't have to exert as much power to lift, and it felt lighter on my back and knees." But this experiment also highlighted challenges. When holding large packages, we open up our arms to shoulder width and hold the package between our arms, but the Power Assist Suit wasn't capable of this movement. Moreover, when moving about, it was difficult to swing arms to keep balance as we would when we walk. With the Power Assist Suit, only the legs moved, so the movement was unnatural, and not able to withstand the intenseness of the movement, some of the parts came off. But President Fujimoto says that discovery of these issues actually become the driving force for development. "When creating markets, we need to work closely with the team on the ground." With this belief in mind, President Fujimoto and his team are trying to create new value that the world has never seen before. They will welcome feedback from people on the ground, resolve the issues that come to light, and conduct more experiments. Activelink will continue make improvements to the Power Assist Suit, which it aims to introduce to the market as a product in the spring of 2017. Activelink's challenge has only just begun.